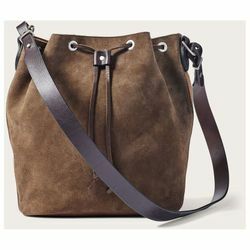 Filson Rugged Suede Cross-Body Bucket Bag. The Rugged Suede Cross-Body Bucket Bag is an heirloom-quality piece crafted in Seattle using the finest American leathers. The body is made of 6-oz. boot-grade Rugged Suede leather from Chicago's Horween Tannery that's specially tanned to provide lasting water protection. It's cotton-lined to protect contents, and outfitted with an adjustable Bridle Leather shoulder strap and cinch-top closure.